Mixed Media Artist: Question of the Month: Art shows? 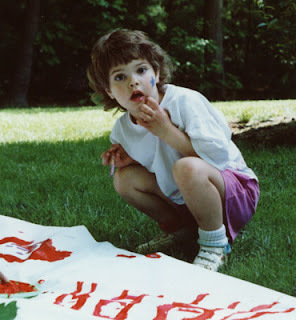 Question of the Month: Would you ever do an art show where you knew you wouldn’t sell anything? Recently, I did exactly that! Our town has been holding an arts fest for a couple of years now, called Art Smart. Local artists, musicians, teachers, and organizations are invited to participate. It’s the only “show” that I do anymore, and even though I sell very little (sometimes nothing) at it, I still like to get out there once a year and hear what people are thinking. Why do a show that you know doesn’t cater to your target audience? I love my town and I love the people. Sometimes that’s good enough. How about you? If doing shows is important to your income, can you imagine doing one that you knew would be a selling bust? 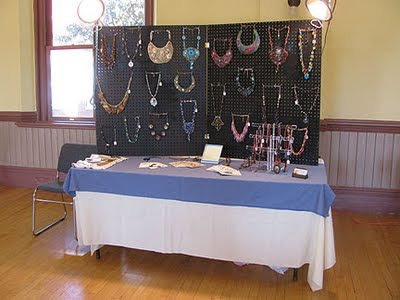 You can leave your comments here, or if you’d like to share a picture of your show booth and a link to your site, email me with the details at cyndi @ mazeltovjewelry.com (remove the spaces). This happens to my mom all the time. Of course. Sometimes a show is just a show ;-) I've also done a few where all proceeds or a percentage went to charity. Yes ~ I think it is great to just get out there, especially if it is in support of your community. Plus, you never know what connections you will make that may benefit you in the future, financially or otherwise! When I was working I always tried to keep the local merchants in my buying loop. It is really important to keep the local community in business. Now that I am retired I would do the same, even if it means setting up for a show and making no business. It is very surprising just how small my province is (or in your case your state), somebody always knows someone else that you know too. Word of mouth is the best advertising and it's free. If you have no up front costs (or minimal) then all you put in is your time. For these types of events I would concentrate on quality rather than quantity. I would also have a draw box where people could enter their names for a really nice item that I have made. I have yet to do a show, need to get some inventory first, but when I do I will take into consideration some of the comments made here as well as follow some of my ideas. Oh, and I would arm-wrestle a helper to be with me at the show. Plus I would have a tool kit with me just in case anything went wrong with any of my items or an adjustment needed to be made. Thumbs up on both the helper and the tool kit, Maxine! I didn't have my usual helper this past time (he had the nerve to be in Japan!! ), but normally I do have help for set up and break down.